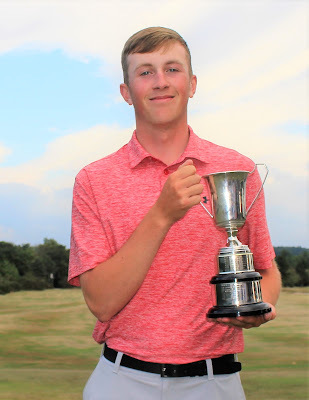 Steven Pears (Nairn) won the North District boys' championship for the R P B Bain Trophy by five strokes over 36 holes at Inverness Golf Club today (Friday). 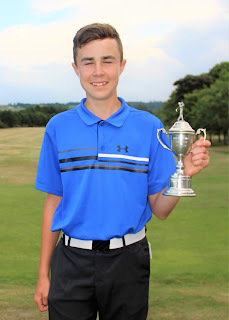 Pears (pictured on right with the trophy) had rounds of 74 and 68 for a four-over-par total of 142, gaining him the Bain Trophy, a silver medal and a £65 voucher. No surprise that Nairn Golf Club won the Emslie Shield team competition with a total of 438 as their junior members filled the first three scratch places. Their team members were: Fraser Owenson, Steven Pears, Ewan Cuthbert and Finlay Wickenden. Owenson gained a bronze medal and a £50 voucher for a second-place finish on 147 (73-74). Wickenden finished third on 149 (75-74). The Under-16 scratch competition was won by Danny Doogan (Golspie) with a pair of 74s for 148, four ahead of William Nicol (Nairn Dunbar) (73-79). Doogan (Golspie) who had two net scores of 69, playing off five. 142 S Pears (Nairn) 74 68. 147 F Owenson (Nairn) 73 74. 148 D Doogan (Golspie) 74 74. 151 J Williamson (Fortrose and Rosemarkie) 74 77. 152 W Nicol (Nairn Dunbar) 73 79. 153 E Cuthbert (Nairn) 76 77. 154 L Gillies (Nairn) 78 76. 156 C Daun (Nairn) 75 81. 159 D MacDonald (Isle of Skye) 85 74, J MacLean (Fortrose and Rosemarkie)76 83. 160 L Bryce-Maynard (Moray) 76 84, N MacKenzie (Muir of Ord) 80 80. 163 A McGillivray (Nairn) 84 79. 167 B Devine (Elgin) 81 86. 168 C Moran (Inverness) 84 84. 170 S Christie (Rothes) 91 79. 172 R MacAskill (Isle of Skye) 87 85. 174 J Mann (Fortrose and Rosemarkie) 84 90, F Davidson (Fortrose and Rosemarkie) 79 95. 175 O Marples (Nairn Dunbar) 89 86. 180 D Wilson (Dragons Tooth) 95 85. 188 R Donnachie (Nairn) 96 92. Disqualified: L Young (Inverness) 90 88, L Cameron (Inverness) 95 86. 138 D Doogan (Golspie) (5) 69 69. 139 D MacDonald (Isle of Skye) (10) 75 64, F Wickenden (Nairn) (5) 70 69. 142 W Nicol (Nairn Dunbar) (5) 68 74, S Pears (Nairn) (scr) 74 68. 143 J Williamson (Fortrose and Rosemarkie) (4)70 73, F Owenson (Nairn) (2) 71 72. 144 S MacKenzie (Muir of Ord) (17) 69 75, D Oddy (Inverness) (16) 77 67. 145 E Cuthbert (Nairn) (4) 72 73. 150 C Daun (Nairn) (3) 72 78. 151 S Lawrie (Nairn) (5) 75 76. 152 L Gillies (Nairn) (1) 77 75, S Christie (Rothes) (9) 82 70. 154 R MacAskill (Isle of Skye) (9)78 76, J Mann (Fortrose and Rosemarkie) (10) 74 80. 155 B Devine (Elgin) (6) 75 80. 156 F Davidson (Fortrose and Rosemarkie) (9) 70 86. 159 R Cromarty (Nairn) 81 78. 160 L Bryce-Maynard (Moray) (scr) 76 84. 162 R Donachie (Nairn) (13) 83 79. L Cameron (Inverness) (26) 69 60.